By Jack Maher | October 15, 2013. Irish sides experience mixed results in the opening weekend of the Heineken Cup action. In Friday’s curtain raiser, Ulster continued their recent home dominance over Leicester in a 22-16 win over the English champions. Ulster went in at half time up 13-10, courtesy of a converted Tommy Bowe try and a couple of Paddy Jackson penalties. After the interval, Ulster pushed on as Jackson made a number of clutch penalties. The result leaves Ulster second in their pool behind French side Montpellier and in good position to qualify for the knockout rounds. Connacht were also involved in Friday’s games as they played host to Saracens. In a spirited performance, the Irish side were left to rue, failing to score in the second half as they had a chance to cause one of the shocks of the opening round, losing 23-17. Two-time winners of the Heineken Cup Munster will have to recover from an early defeat away to Edinburgh. Both sides scored two tries apiece but it was the lack of discipline of the Irish side which proved the difference as Greig Laidlaw was flawless with his kicks. In all, Laidlaw kicked 19 points as his side came out on top 29-23. The result leaves Munster third in their pool as they claimed a potentially priceless losing bonus point. Leinster were the final Irish side in action over the weekend as they travelled to Swansea to take on the Ospreys on Saturday evening. Having endured a slow start Leinster were soon in the ascendancy, courtesy of a try from man of the match Sean O’Brien and a couple of penalties from Jimmy Gopperth, including one from his own half. 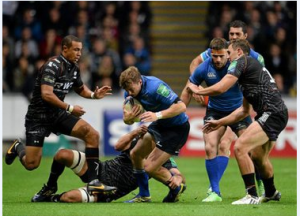 In the second half, Leinster were in complete control, coming out on top 19-9 and denying Ospreys even a losing bonus point to go top of their pool. In the final game of the weekend former Leinster outhalf Jonny Sexton had a successful debut in the tournament for new club Racing Metro 92, as his side defeated fellow French heavyweights Clermont Auvergne 13-9 to go second in their pool.